"The Inca society was the society of the Inca civilization in South America. The Inca Empire, which was centred in what is now Peru, Bolivia, Ecuador and southern Colombia and lasted from 1438 to 1533 AD, represented the height of this civilization. The Inca state was known as the Kingdom of Cusco before 1438. 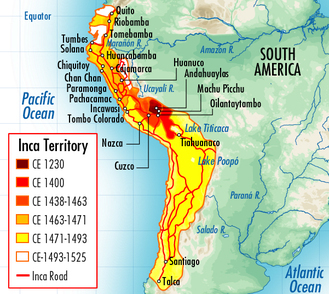 Over the course of the Inca Empire, the rulers used conquest and peaceful assimilation to incorporate in their empire a large portion of western South America, centred on the Andean mountain ranges. The empire proved relatively short-lived however: by 1533, Atahualpa, the last Sapa Inca (emperor) of the Inca Empire, was killed on the orders of the conquistador Francisco Pizarro, marking the beginning of Spanish rule. The last Inca stronghold, the Neo-Inca State in Vilcabamba was conquered by the Spanish in 1572."